Argues that humans used to know how to eat well. This book shows readers how they might start making thoughtful food choices that will enrich their lives and their palates and enlarge their sense of what it means to be healthy. Eat food. Not too much. Mostly plants. These simple words go to the heart of Michael Pollan's In Defence of Food . Humans used to know how to eat well, Pollan argues. But the balanced dietary lessons that were once passed down through generations have been confused, complicated, and distorted by food industry marketers, nutritional scientists, and journalists- all of whom have much to gain from our dietary confusion. Indeed, real food is fast disappearing from the marketplace, to be replaced by nutrients, and plain old eating by an obsession with nutrition that is, paradoxically, ruining our health, not to mention our meals. 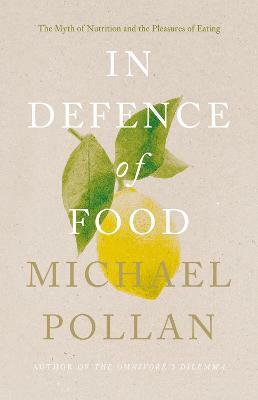 Michael Pollan's bracing and eloquent manifesto shows us how we might start making thoughtful food choices that will enrich our lives and our palates and enlarge our sense of what it means to be healthy. Michael Pollan is an award-winning author, activist and journalist. His no.1 international bestselling books about the way we live today - including The Omnivore's Dilemma, In Defence of Food and Cooked (also a successful Netflix series) -- combine meticulous reporting with anthropology, philosophy, culture, health and natural history. Time magazine has named him one of the hundred most influential people in the world. He lives in the Bay Area of California with his wife and son.